Britain is currently basking in a glorious and unexpected heat wave. What’s more, these Mediterranean temperatures are expected to last for another week at least, giving us plenty of time to replenish those thoroughly depleted Vitamin D stores and get some fresh air for once. Unfortunately, great weather has its setbacks – especially for those of us with frizz-prone hair. If your hair tends to ignore the laws of gravity at the first whiff of BBQ smoke and sun-cream then your ropey locks might be needing some serious TLC. This simple product from Boots stops hair becoming dry and brittle under the heat of the sun and the chlorine in the pool. It has a summery scent, it’s non-greasy and it comes in an easy-to-use squeeze bottle perfect for taking on holiday. 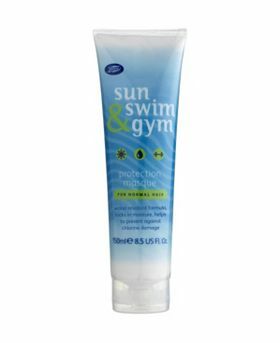 You can buy Boots Sun Swim and Gym Protection Masque for Normal Hair for just £3.35. If you like to rock a styled, beach hair look then this sun protecting wet-look styling gel from No Inhibition is perfect for you. This hi-tech memory hold resin works well with cute pixie-cuts, tousled beach waves and slicked-back styles. You can buy No Inhibition Wet Hard Gel for £12.50. If you were just too keen to get outside to think about protecting your hair, not to worry. You can restore sun damaged hair after a day of sunbathing with this after-sun care for your hair and body from Aveda. This formula is rich and smells gorgeous with aromas of ylang ylang, neroli and cistus that will remind you forever of those warm balmy days you enjoyed back in the summer of ’13. You can buy Aveda After-sun Care Hair and Body Cleanser for £19. The Frederic Fekkai is a favourite with celebrities, which is reflected in its slightly steeper than average price tag. Of course, all of those singers and actors who spend so much time partying on their French Riviera yachts need some way to protect those impossibly glossy locks from damaging UV rays. This leave-in conditioner is perfect for anyone who prefers to leave their hair free of product during the day. Spend a pampering evening before you head outside getting beach-ready by coating your hair in this luxury formula from the Marine range. You can buy Frederic Fekkai Marine Beachcomber Leave-in Conditioner for £19.